When you hear the word “cabbage”, what comes to mind? A rounded ball of green and white leaves, I guess. It would be interesting to note that there are over 400 varieties of cabbage grown throughout the world. Among these varieties comes a lovely variety called the red/purple cabbage. The red cabbage is a cruciferous vegetable, which gets its red-purplish color from the presence of a phytonutrient called anthocyanin. Depending on the pH balance or acidity of the soil, this plant could assume different colors such as red, purple or even blue. It is a seasonal plant which could be eaten either cooked or raw. Is the red cabbage the same as the green cabbage? Yes, and no. There are significant differences between the red and green cabbage. Although they taste almost the same, their nutritional value differs to a certain extent. They each have their unique powerful nutritional values. Iron: Packs double the amount of iron compared to the green cabbage. Vitamin A: Contains ten times more (precursor) vitamin A than green cabbage. The high vitamin A content helps prevent eye problem such as macular degeneration, astigmatism and cataract. Vitamin C: Good amount of vitamin C, which aids collagen synthesis to help your skin repair and prevent premature aging. Anthocyanin: Dominant phytonutrient is anthocyanin which is a cancer-fighting flavonoid that protects against free radicals. Anti-inflammatory: Very high antiviral and anti-inflammatory properties. Immune system: Beneficial for boosting the immune system and treating high blood pressure. 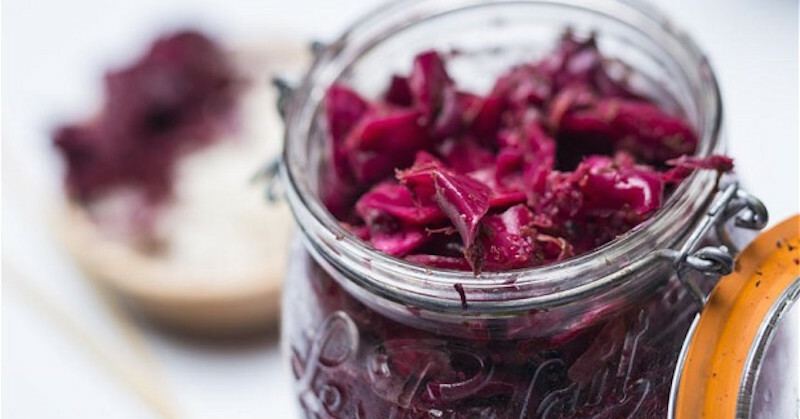 Gut health: Red cabbage is an excellent option for fermenting into sauerkraut or kimchi for super gut healthy probiotics. Vitamin K: Contains twice as much vitamin K as the red cabbage. Vitamin K helps your blood to coagulate, regulates bone mineralization by increasing bone density. Vitamin C: Good amount of vitamin C as compared to the red cabbage. Folate (vitamin B9): Our bodies need folate to make DNA and other genetic material. Folate is also needed to make red and white blood cells in the bone marrow. It’s a pretty important vitamin that is often overlooked. Gut health: One of the most outstanding health benefits of drinking green cabbage juice is its ability to heal peptic ulcers within days, due to its higher content of vitamin U. Fermenting cabbage into sauerkraut or kimchi makes it a superfood for a healthy gut. Immune system: Like red cabbage, the green cabbage has very high amount of vitamin C that is an excellent help to boosting the immune system. One exceptional quality of the red cabbage which makes it so consequential to the maintenance of the overall health of the body, is the presence of phytonutrients such as anthocyanins, isothiocyanates, indoles and polyphenols. These phytonutrients work as powerful antioxidants that protect the body against free radicals, accelerated aging, and diseases. Anthocyanins acts as antioxidants to fight free-radicals. It offers anti-inflammatory, antiviral and anticancer benefits. ARS (Agricultural Research Service) scientists have identified 36 anthocyanins in red cabbage. Evidence suggests that anthocyanins may provide cancer protection, improve brain function and promote heart health. Isothiocyanates occur naturally as glucosinolate conjugates in cruciferous vegetables. They are sulphur-containing phytochemicals with strong anticancer effects, combatting carcinogens by neutralizing them and reducing their poisonous effect. Indoles are substances found in cruciferous vegetables when crushed or processed. Also referred to as indole-3-carbinol, it is a powerful antioxidant that has been proven to help in preventing cellular damage due to free radicals and maintains the hormonal balance in the body. Polyphenols (a.k.a. phenolics) are a group of phytonutrients that fight cancer cells, promote brain health, reduce inflammation, regulate blood sugar levels, protect hearth health and prevent premature aging. Alzheimer’s disease, prevent: A study on anthocyanins shows that this compound has the capacity to modulate cognitive and motor function, enhance memory and prevent age-related declines in neural function. High content of anthocynanins in red cabbage may be helpful in the prevention of mental diseases such as dementia and Alzheimer’s. Anticancer: One of the most important health benefits of red cabbage is its ability in preventing cancer. Studies show that red cabbage prevents lung and esophageal cancer, and lowers the risk of other cancers, including liver and gastrointestinal cancer. Antiaging: Antioxidants prevent free radicals from damaging your cells. They protect your body from premature aging, by aiding in the synthesis of collagen, protecting your skin from sun damage, keeping your skin wrinkle-free and glowing. Anti-inflammatory: As in many cruciferous vegetables, the red cabbage contains the precursor compound that form sulforaphane, a powerful anticancer and anti-inflammatory property that is beneficial for treating inflammation in patients suffering from arthritis, asthma and gout. Blood building: Red cabbage contains twice the amount of iron in green cabbage. This makes it a good source of iron if you’re anemic. Juicing red cabbage is one of the best ways to enjoy all of its benefits. Blood purifying: Cabbage is one of the most alkaline foods that helps to prevent acidosis (over-acidity in the blood). The presence of glucoraphanin and the myrosinase enzyme for the production of sulforaphane makes cabbage (and red cabbage) an excellent food for the purifying the blood. Sulforaphane helps the body to detoxify harmful free radicals and pathogens that can cause untold damages in the body. Read here on others alkaline forming food. Bone health: Red cabbage contains all the important minerals such as calcium, magnesium, sodium and phosphorus, that are necessary for bone health. Eating red cabbage regularly helps protect against osteoporosis, strengthen bone density and prevent arthritis and bone inflammation. Eye health: Due to the very high content of vitamin A in red cabbage, it helps protect your eyes from macular degeneration, cataract formation and other age-related eye problem. Diabetes: Anthocyanins have been found to lower blood sugar levels by improving insulin resistance. This makes red cabbage a great inclusion in the diet of diabetics. Gut health: The synthesis of sulforaphane and the consumption of same from the red cabbage does a great good for your gut health. It supports the population growth of the beneficial bacteria that protects the gut from various digestive issues such as acid reflux, leaky gut, IBS and ulcers. Heart health: Studies show that a higher intake of anthocyanin-rich foods can lower risk of a heart attack. Red cabbage is rich in antioxidants and minerals that make it a great food for reducing blood pressure. And, due to its anti-inflammatory properties, it reduces inflammation in the heart, thus protecting it against heart diseases. Immune system: The high content of vitamin C and antioxidants in red cabbage are important for boosting your immune system. It strengthens the white blood cells in minimizing harmful effects of harmful pathogens in the body. When buying red cabbage, choose ones that are tightly packed, heavy for its size, and rich in its red or purple color. Whole cabbage can keep in the fridge for one to two weeks, and about five to six days once cut. If you can’t use up an entire cabbage head, peel off the leaves by layers instead of cutting it, so that the unused portion can be stored away for longer without oxidizing. Red cabbage is rich in many vitamins, minerals and antioxidants. It is excellent to be eaten raw, or cooked minimally—boiled, steamed, lightly stir-fried or sautéed. 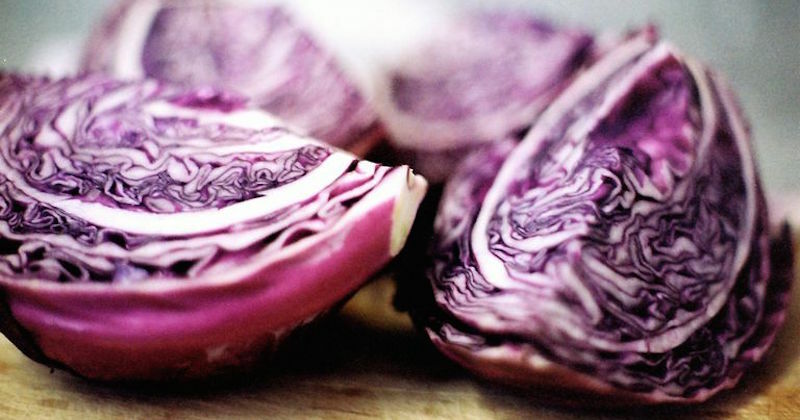 To get maximum benefits from your red cabbage, it is best to eat it raw. And what better way than to make a red cabbage salad. Because of the beautiful color, you can add any other fruit or vegetable to it to make a very interesting and appetizing bowl of salad. 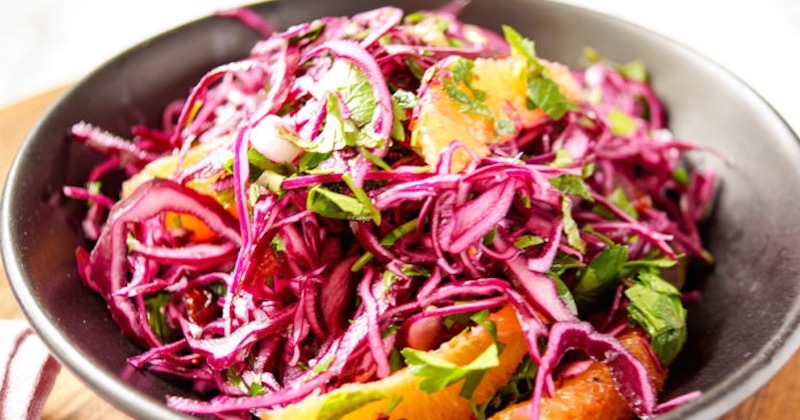 An easy salad recipe: Finely chop or shred the desired amount of red cabbage. Toss with a little olive oil, apple cider vinegar, and a pinch of sea salt and pepper, or your favorite salad dressing. For an extra burst of color, add a few wedges of mandarin, or some shredded carrots, and any greens for garnish. Juicing is one of my favorite ways of consuming red cabbage. Always use organic, whenever possible. Red cabbage is sweet when juiced. It can be juiced on its own, or with other added ingredients. I usually add a quarter lemon slice (with peel) and an inch-cubed size of ginger root. The lemon makes the juice more bioavailable in your body. Instead of lemon, you can also use a whole orange that also does the trick! 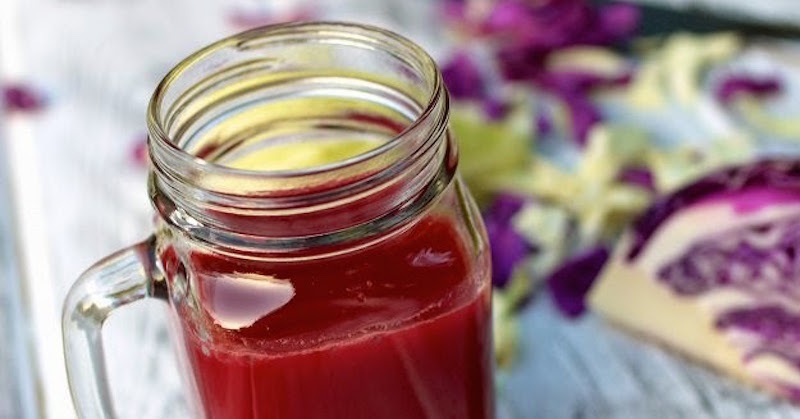 Definitely drink red cabbage juice daily for a time, if you have inflammation in the body. Flood your system with this highly nutritious, anti-inflammatory, antioxidant-rich drink for therapeutic treatment of any ailment. 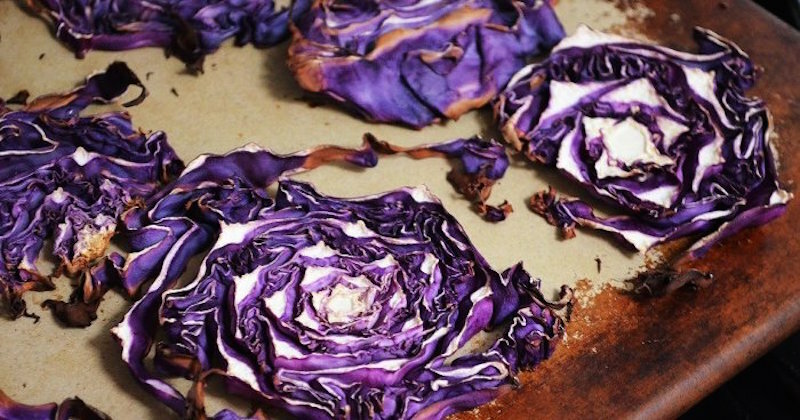 This red cabbage chips are so easy to make for a healthy snack or as a side for dinner. It is a hit and gets over quickly every time I make it. Try it! Preheat your oven to 400o F.
Brush both sides of each cabbage slice with olive oil. Spread the garlic evenly on each side of the cabbage slices, and season them to taste with salt and pepper. Roast in your oven for 20 minutes; then turn the slices over and roast them again for another 15 minutes or until the edges are crispy. Sauerkraut is one of the best fermented foods that provide an abundance of lactic acid (a.k.a. beneficial bacteria) for improving your gut health and digestive system. A good population of beneficial bacteria helps to lower the pH of your digestive tract and creates a healthy environment for the good bacteria, but it’s bad news for the bad bacteria. Go here for the recipe on fermenting cabbage (red or green). Go to the Vegetables Section for more healing vegetables.